ALEXANDRIA, Minn. (CNS) — The energetic spirit of the 200-plus people who gathered in Alexandria April 13 and 14 for the Region VIII encuentro captured the heart of St. Cloud’s Bishop Donald J. Kettler. The event was one of the year’s highlights for him, he said during a presentation to the gathering. 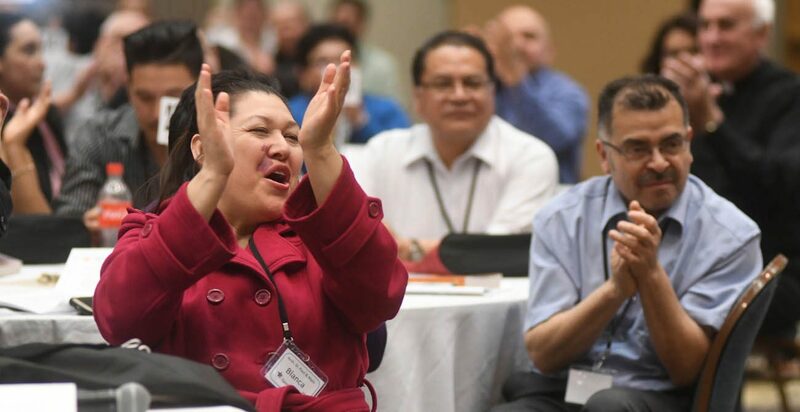 Regional meetings are the latest phase of a multiyear preparation process for “V Encuentro,” or the Fifth National Encuentro, to be held Sept. 20-23 in Grapevine, Texas. First came parish-level encuentros, then diocesan gatherings and now the regional meetings. Previous national encuentros were held in 1972, 1977, 1985 and 2000. The U.S. church’s Region VIII covers Minnesota and North and South Dakota, and dioceses in those states sent delegates to Alexandria. The regional encuentro had seven areas of ministry focus drawn from input given at the diocesan level: leadership development and pastoral training, families, youth and young adults, evangelization and mission, faith formation and catechesis, liturgy and spirituality, and immigration. Attendees heard from bishops and other leaders. In addition to Bishop Kettler, other bishops attending were Auxiliary Bishop Andrew H. Cozzens of St. Paul and Minneapolis and Bishop Robert D. Gruss of Rapid City, South Dakota. Bishop Kettler said there are many ways in which people can accompany others, including “our ministry to young people, our families, out on the peripheries with the poor, the immigrant, the refugee. Maria Sinchi of the Archdiocese of St. Paul and Minneapolis was part of a 13-member team of young adults who attended the regional encuentro from St. Stephen Church in Minneapolis. Sinchi said what excited her most about the Alexandria gathering was the motivation to go and evangelize. The youth have a lot of responsibility in the church today, Sinchi said. She added that the young adults want the older generation to know that they should keep encouraging and motivating them. Arturo Salgado, a member of St. Mary Church in Melrose, in the Diocese of St. Cloud, was most excited about the relationships the regional encuentro offered him. “I met with people from other parishes and dioceses. We are all working for the same point so this is very exciting,” he said. He is most enthusiastic about all becoming “better Catholics” and building up the youth. The event also featured a procession with the regional “V Encuentro” cross representing all 10 dioceses of the region, a talent show with cultural flair, a Holy Hour and Mass. A commissioning ceremony for all the delegates traveling to the Fifth National Encuentro concluded the celebration. Anderson is a reporter with The Visitor, newspaper of the Diocese of St. Cloud.